Mapping the History of Downtown Manhattan. During the real estate slump of the early 1990s Downtown needed a revival. Heritage Trails under the leadership of the JM Kaplan Fund hired VanDam to create a 3-D map to illustrate a series of historic trails and tell the history of Downtown Manhattan. The map was to be used across various media: on 42 site markers at key Downtown locations, through an accessible guidebook that told the history and showed the infrastructure of Downtown and on-line via the internet. VanDam created a sheared 4-point perspective that would let users see all the buildings and the historic trails at the foot of the canyon. The map not only helped visitors negotiate a 17th C. Dutch grid under a veritable museum of early 20th C. skyscrapers, but also became the institutional identity of Heritage Trails. Honored by the American Institute of Graphic Arts (AIGA), the map continues to be the leading way-finding system in Downtown Manhattan. 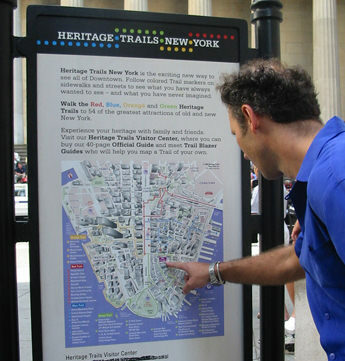 42 site markers placed at major intersections in Downtown Manhattan offer self-guided tours and help visitors understand the vertical city.